Crazy Eddie's Motie News: Ten years ago, we were partying like it was 1929. Are we about to do it again? Ten years ago, we were partying like it was 1929. Are we about to do it again? I concluded Diversity and fantasy in comedy nominees at the 2018 Primetime Emmy Awards by telling my readers that I would "observe the 10th anniversary of the Lehman Brothers bankruptcy, when we were partying like it was 1929." I begin with an examination of the collapse of Lehmann Brothers a decade ago from VOA News reporting Ten Years After the Financial Crisis: What Happened, What We've Learned. It will be 10 years this week since the collapse of investment bank Lehman Brothers, one of the casualties of the U.S. subprime mortgage crisis. The ripple effects sent the global economy into a tailspin and brought on the worst financial crisis since the Great Depression. VOA correspondent Mariama Diallo takes a look at the impact of that turbulent economic period and the lessons learned a decade later. That's actually a pretty good summary of the crisis from an elite perspective. For what it looked like at ground level, I recommend US: Pains of the financial crisis still felt 10 years on by Al Jazeera English. Saturday will have been a decade since the collapse of the Lehman Brothers investment bank triggered a global recession. While the crisis played out on Wall Street and in government ministries, its roots lay in small towns and cities across the US, where families pursuing the so-called "American Dream" of home ownership fell victim to unscrupulous banks and predatory lending schemes. While Wall Street and the banks may have recovered, many Americans are finding their road to recovery longer and more difficult. Al Jazeera's Rob Reynolds reports from Perris, California. Thirty years ago, I lived just over the county line to the west of Perris, so this story literally hits close to home. Speaking of which, I was fortunate to have gotten out of the housing market just in time, as I wrote in 2014. The news on the radio in June 2005 trumpeted record home sales and prices. I took it as a sign of the market top I'd been looking for since 2001 and immediately drove to the nearest real estate office to my home in the Irish Hills of Michigan and listed my house for sale. The house sold in April 2006 and closed in May 2006, just as the bottom was about to fall out. The result was that I got out of the market just in time...then rented from 2006 until now, eight years of riding the real estate market down by staying out of it. It wasn't all luck. I knew the housing bubble would pop, but I had no idea how big the explosion would be. It ended up being far worse than I expected. Both of the above looked back at the start of the Great Recession and how it led up to today. What about the future? MSNBC did that in 10 Years After The Lehman Brothers Collapse, Here’s Where We Stand | Velshi & Ruhle. 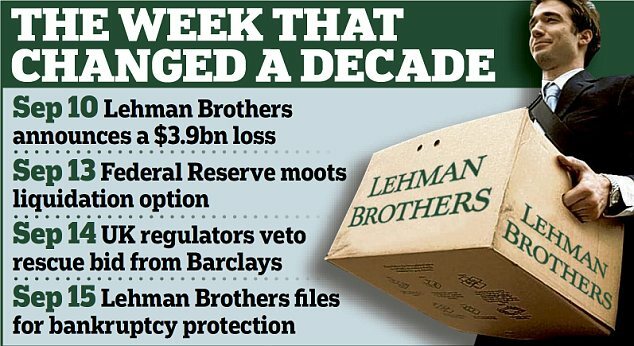 10 years ago this week, Lehman Brothers collapsed, marking the largest domino to fall leading to the financial disaster of 2008. Stephanie Ruhle discusses whether or not anything has changed and if we could end up making the same mistake. Weighing in: Axios Chief Financial Correspondent Felix Salmon, Princeton Professor Eddie Glaude and the Editor-and-Chief of American Consequences, PJ O’Rourke. Student loan debt is indeed a problem, one that I've mentioned only once on this blog thanks to Benie Sanders campaigning on the issue in Ann Arbor two years ago. However, I doubt it will send the economy into recession the way the housing bust did in 2007-2008, as the value of housing declining contributed to reduced consumption then caused a financial crisis, which made the recession worse. That's because the value of a college education will not decline before a recession, so that won't drag down the valuation of the debt as an asset, putting strain on the financial system and causing a panic to start a recession. Instead, the causality will go the other way; the recession will hit first, causing people to lose their jobs and make them unable to pay. That will cause a debt crisis in the financial system. At least banks can't foreclose on and repossess people's educations, so the students will still have them, unlike all the people who lost their homes, although that's small consolation to the graduate whose increased earnings from their education have gone to paying off the debt to get their education. That alone is reducing consumption and home ownership, slowing down the economy. I conclude by observing that this is a good time to update the recession call I made in The tax bill and the U.S. economy in 2018 and beyond. I thought then that the U.S. would go into recession by the end of this year. That's not going to happen. It looks like the tax bill has stimulated the economy enough that it will continue expanding into next year. However, the next recession is still coming. Based on New Deal Democrat's analysis at Seeking Alpha, that should happen in the second half of next year, so I'm moving my recession call to between July and December 2019. The bad news is that my readers and I may not know until the middle of 2020. The good news is that it would be perfectly timed to screw up Trump's re-election, should he last that long, or Pence's should he not. I can live with that.